Nobody said this thing would be easy! Below are daily route details of our upcoming Parkway trip. Our official start will be from Nellysford, although some will opt to be driven another ten miles to Rockfish Gap to ride from the official start of the Parkway. If I were riding, that would be my choice. Adding another 10 miles and 1,500 feet of climbing to the elevation profile makes this a brutal day. 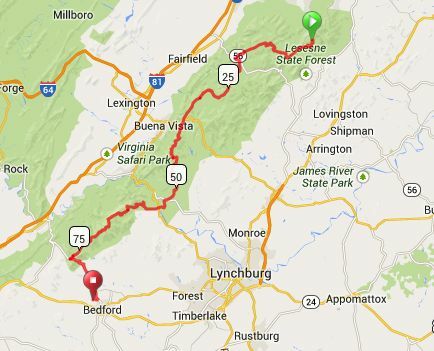 On this day, riders will reach the lowest elevation point of the parkway, and also the highest parkway point in Virginia. The signature climb will be 13-miles to the top of Apple Orchard Mountain. We will finish at Peaks of Otter in Bedford. Staying at Vanquility Acres Inn. After leaving Peaks of Otter, the riders will face the toughest riding day of the week, with the longest mileage and second most climbing. 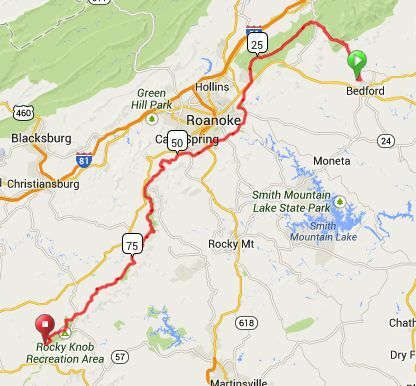 We’ll roll through Roanoke, Virginia, and face a lengthy 7-8 mile climb as we leave the city, ending at Bull Run Knob. After Roanoke, we’ll be rolling through rural, agricultural territory. There will be a handful of short climbs, but most of the latter part of the day will be rolling hills. We’ll end the day at Rocky Knob Recreation Area. This will be a “light” day compared to the days prior and those to come. We’ll leave Rocky Knob and travel into North Carolina, pass through Cumberland Knob, and end not far from Sparta, NC, just shy of Stone Mountain State Park. Again, the climbs will be short, maybe a mile or two at the most, and the riding will be rolling hills. Staying at Glade Valley Bed and Breakfast. It’ll be back to the marathon stages from here on out. This day will begin with climbing from Stone Mountain up to Air Bellows Gap, approximately 8-9 miles with some short descents in between. From there it’ll be rolling hills up to the High Country. 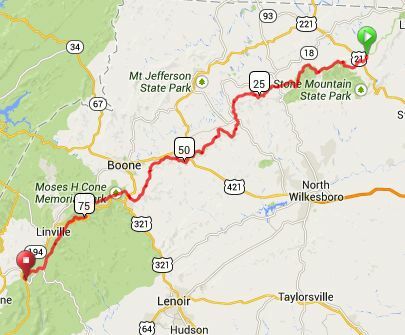 We’ll ride through Blowing Rock, up near Grandfather via the Linn Cove Viaduct, and end our day at Linville Falls. 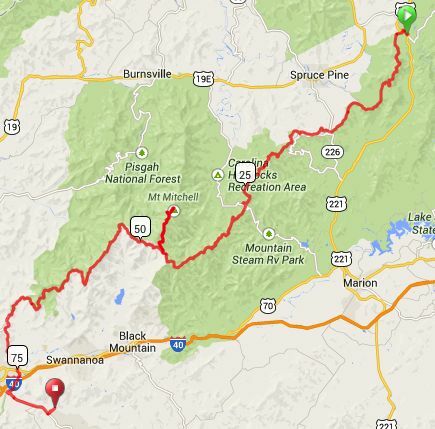 Aside from Air Bellows Gap and the Viaduct, most of the climbs will be shorter. Staying at Linville Falls Lodge. As we leave the High Country, we’ll face perhaps the toughest challenge of the trip — Mount Mitchell. Our climb will begin at Highway 80, just like the Assault on Mount Mitchell. We’ll ride up the Parkway and turn into the State Park, not stopping until we reach the summit. 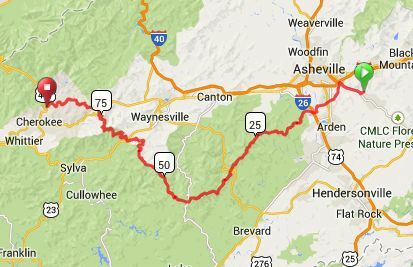 From there it’ll be mostly downhill through Craggy Gardens and into the city of Asheville. The last day will be no cakewalk. We’ll start out with the 13+ mile climb up to Mount Pisgah. Afterward the big climbs will continue. 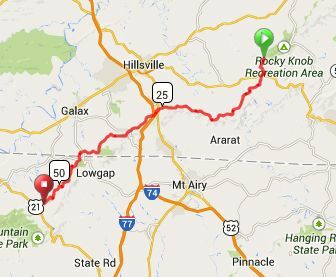 We’ll hit the highest point of the Parkway, Richland Balsam Mountain, then climb 8-miles up to Waterrock Knob. Soon after, we’ll make the final descent into Cherokee, NC, completing our expedition. This entry was posted on Monday, September 23rd, 2013 at 5:15 am	and posted in Blue Ridge Parkway. You can follow any responses to this entry through the RSS 2.0 feed.